With the football season coming up many of us are tailgating and attending football watching parties. I always like to do something cute to tie in with the theme of any party. Like these football cupcakes. This recipe is super yummy. Yes I said super yummy because those are the only words that come to mind to describe this recipe! They are easy to decorate, trust me I'm no artist and I was able to make them look like footballs! In a large mixing bowl, cream together the butter and sugar on medium speed. Add in the eggs one at a time until thoroughly mixed together. Add in the milk and vanilla extract. Slowly add in the cocoa powder and flour, and then add in the baking powder, and salt. Fill the cupcake liners with the mixture until ¾ full and bake for 20 minutes. While the cupcakes are cooling, mix together the butter and ½ cup of powder sugar at a time until all of the powdered sugar is mixed in. Remove about ¼ of the frosting and place in a small bowl. Set aside. Add in the cocoa powder to the rest of the frosting and mix until mixed together. 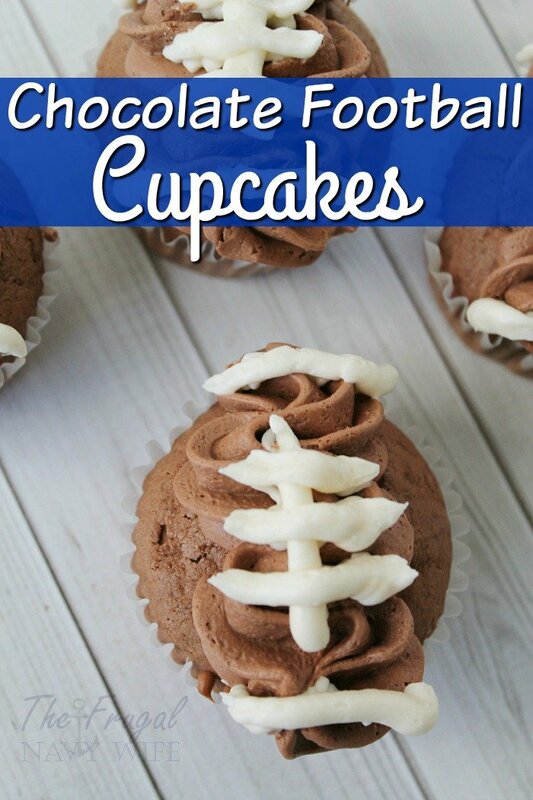 Using a pastry decorator swirl the chocolate frosting until the cupcakes in the shape of a football. Add in the white frosting to another pastry decorator and add in the lines of a football. Make sure to check out all our other great cupcake recipes. Our Orange Crush Cupcakes are our most popular! Fill the cupcake liners with mixture until ¾ full and bake for 20 minutes. While the cupcakes are cooling, mix together the butter and ½ cup of powdered at a time until all of the powdered sugar is mixed in.